Brace yourself, because I am about to tell you about a product that you have to RUN out and get – if you like barbecue that is, and if you miss the taste and visuals of barbecued ribs. 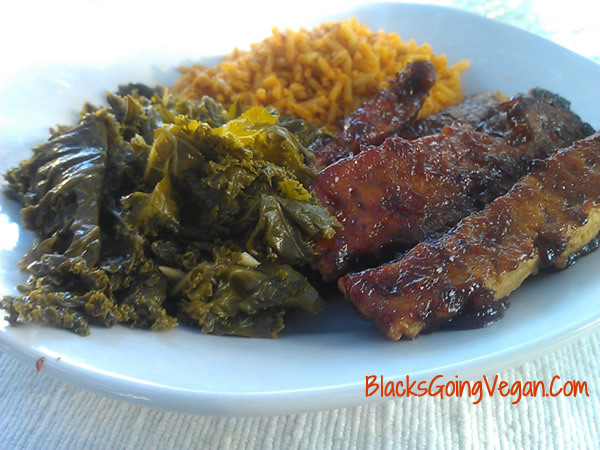 Yeah I’m vegan, but I haven’t advanced to the point where I am past missing certain dishes, and barbecued ribs is one of them. Never fear, I’ve found a fabulous substitute! This easy-to-make mix makes getting the ribs from the oven to your plate faster and simpler than anything I’ve made recently. 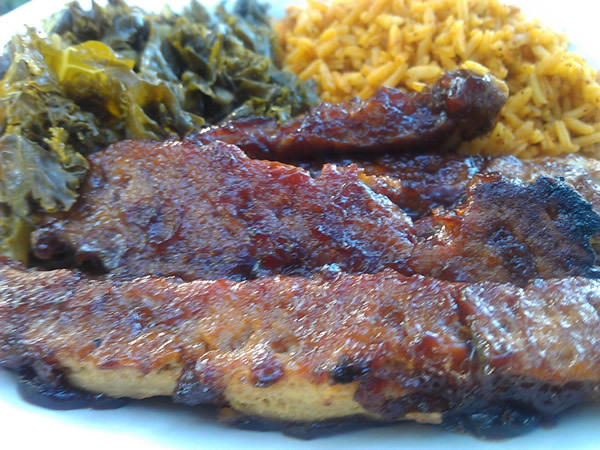 These ribs not only look great, with a texture surprisingly close to real meat, but they taste really good too! 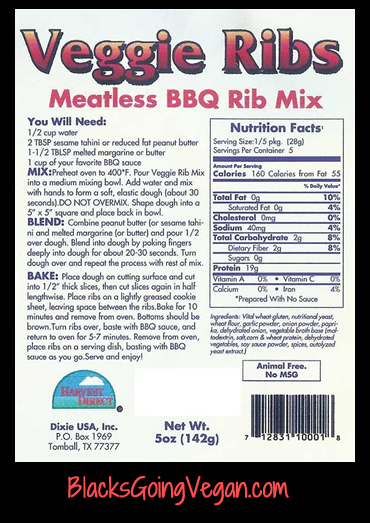 On a whim, I was ordering a few products online when I happened to see an ad on the site for a vegan ribs mix. Since it was only $4.00 I decided to order a bag to try. Glad I did! Very simple list of ingredients which I liked: vital wheat gluten, onion powder, nutritional yeast, garlic powder, paprika, vegetable broth base, soy sauce powder, and dehydrated onion. Simple. And since its made with seitan, the protein count is right around 20 gms per serving. 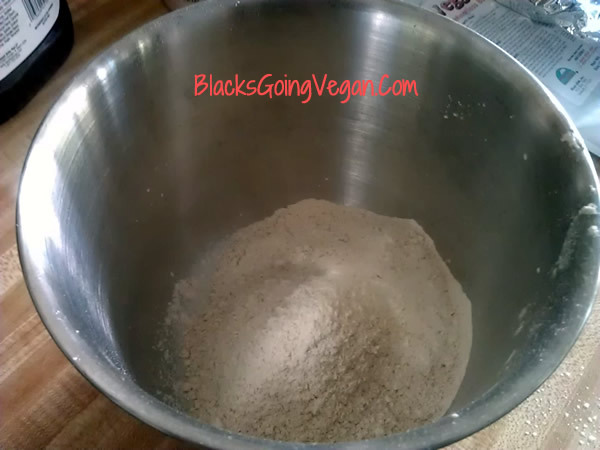 To make: dump powder in bowl, add water, peanut butter and melted Earth Balance; flatten out, slice up, put on baking sheet, brush with favorite barbecue sauce (I used Sweet Baby Ray’s) and bake. The End. Remember me saying I love the “Sit Down and Cook” method of meal preparation? Well this doesn’t quite fit in that category because the ribs cook quickly. In about 10 minutes it’s time to turn them over to baste and bake the second side. I served mine with sauteed kale and Spanish Rice, leftover from a few days ago when we had burritos. This was really good for a mix, I have to admit that I was shocked. Order more than one package! 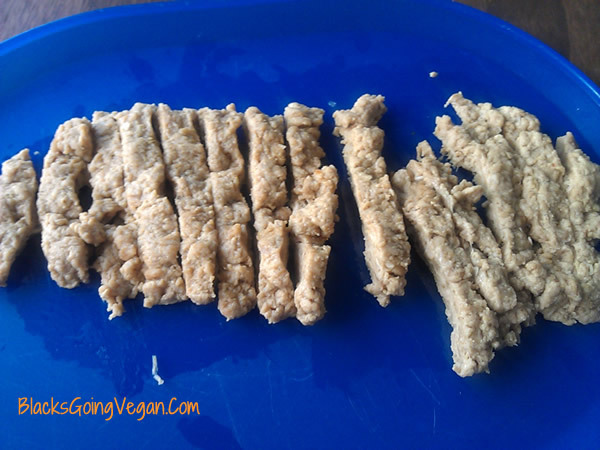 If you like seitan and you like barbecue, you’ll want to have plenty of these puppies handy for last minute meals for the family or if guests should stop by unexpectedly. Though the package says it serves 5, it only served 3 of us. I suppose we must be horribly greedy hollow leg-like creatures – but if you have hearty eaters in your house, plan accordingly..
Click star rating above to go right to their web page at Healthy-Eating.Com.